Inside these pages lies unspeakable horror. Bloodsplattering, brain-impaling, flesh-devouring horror. 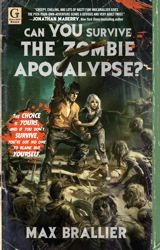 You've probably read your fair share of zombie stories. But this time it's different. No longer can you sit idle as a bunch of fools make all the wrong moves. All hell is about to break loose—and YOU have a say in humanity's survival. Violet McKenna isn't a normal girl with normal teenage issues; she has more to contend with than most people could handle. Violet thought she was just crazy when she had a vivid vision of her dad's murder. Her life started falling apart when her premonition came true. She's had flashes of other events too. The problem was nobody believed her until she found a new school: Winterhaven. At Winterhaven, Violet finally feels like she belongs. She quickly finds a close group friends and discovers that they too have psychic 'gifts'—as do all the students at Winterhaven. But as soon as she feels settled she discovers the most intriguing and alluring boy she has ever met, and things quickly go awry. As the attraction between them grows, intense visions of the boy's death start to haunt her. In her premonitions the secret he is unwilling to share begins to reveal itself. And to Violet's horror, she learns that their destinies are intertwined in a critical--and deadly--way. Heh~~ Do you think you could survive the Zombie Apocalypse? 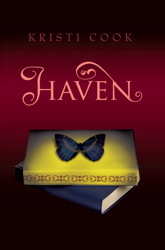 I can;t wait for Haven. I hadn't heard of the zombie one. Like a choose your own adventure. I'll have to let my fiance know about this one. He's always complaining that the people in a zombie apocalypse act like morons.